Design that allows for aging-in-place is more popular than ever. 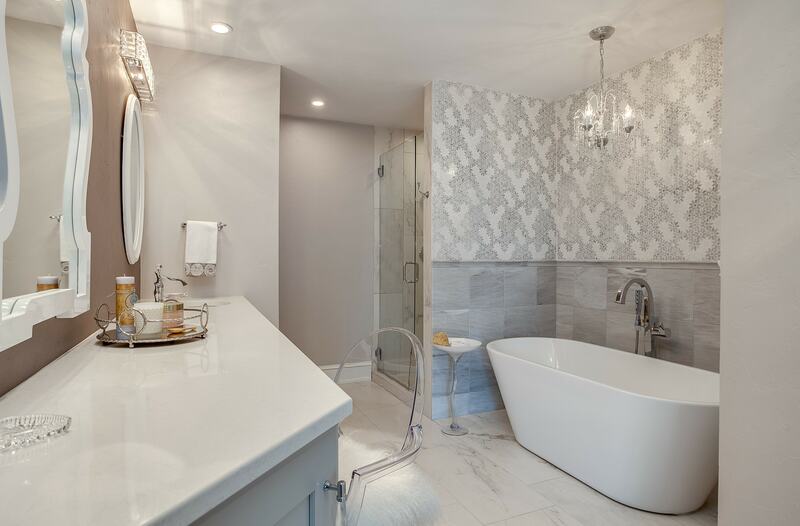 When we design baths to be more accessible, we look for opportunities to include a full bath on the first floor of a home, offer wider halls and doorways and specify non-slip flooring, shower seats and grab bars for the tub, water closet area and shower. 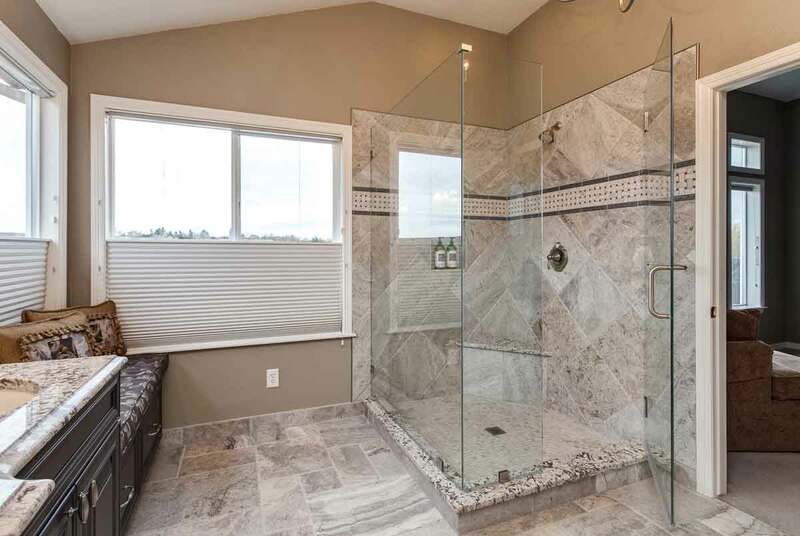 We often present our clients looking to remain in their home for the extended future with an option of a large walk-in shower without a threshold. 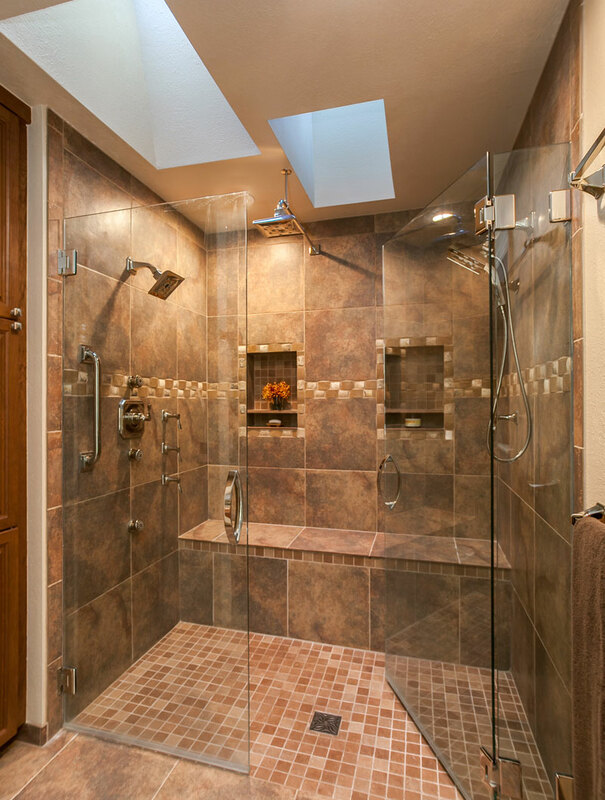 For many remodels, a larger shower area can be achieved if the tub is eliminated. 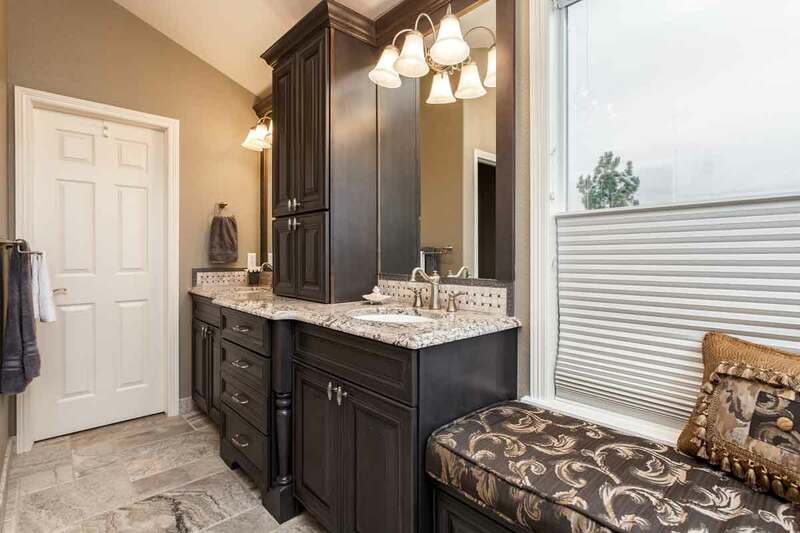 Double vanities are among the most requested feature when we are designing a new bath along with storage capabilities, stone or engineered stone (quartz) vanity tops and private water closet compartments. Creating a spa-like retreat in a home is another dominant trend. System tubs that offer hydrotherapy, aromatherapy, and light therapy appear on a number of our clients wish lists. We can convert a bath into a wet room by offering steam and different therapies that promote wellness and a healthy lifestyle. 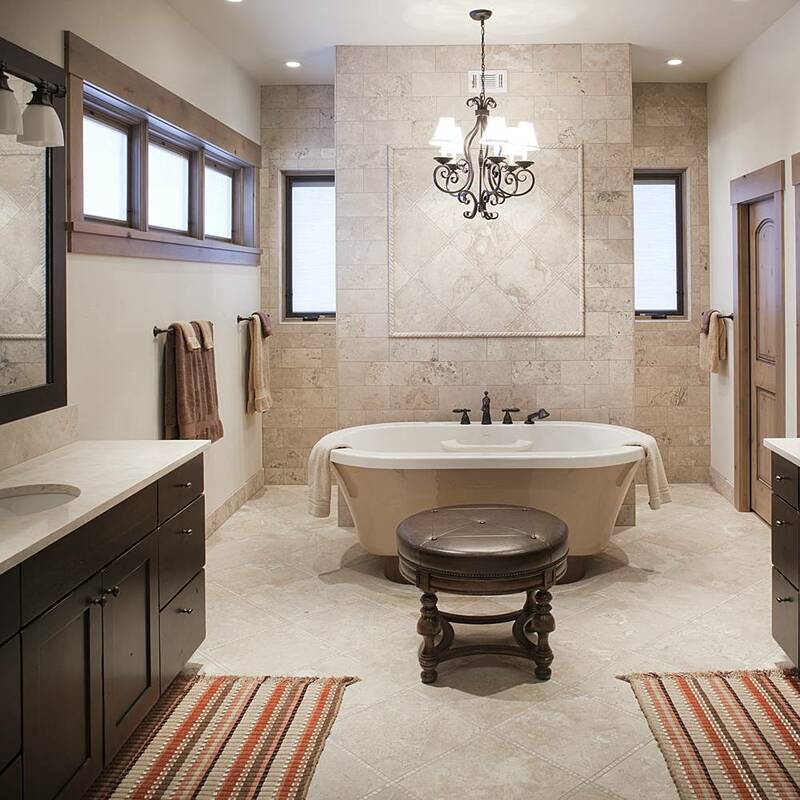 Freestanding tubs that serve both functional and aesthetic purposes continue to trend high. Many of our clients come to the showroom wanting to incorporate bolder colors in their fixture finishes such as bronze and black. For whole home projects, our clients are attracted to the consistency of imagery among baths that feature similar products and approaches in powder rooms and secondary baths that are used for the master suite. The bathroom continues to evolve from a purely a functional space to a place that provides an opportunity for homeowners to make distinctive and unique statements. Form and functionality play equal roles in today’s baths and that means incredible opportunities to have fun creating stunning outcomes. 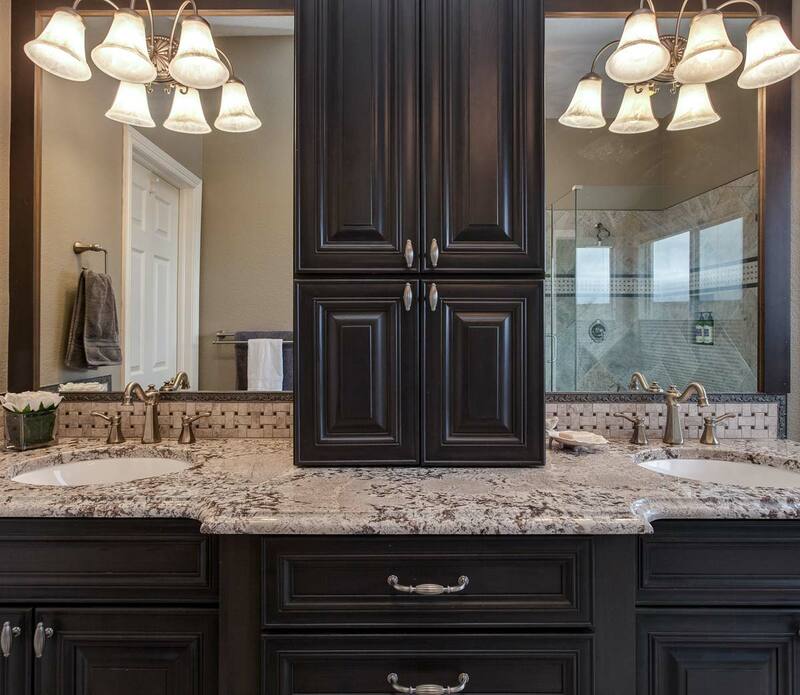 Vanities, sinks, faucets, and mirrors have become the epicenter of bathroom design. Tubs and showers come in as many sizes and shapes as the imagination allow for and both have been transformed into works of art in addition to serving as places to bathe. Powder rooms are a popular space to have fun and stretch boundaries. The powder room typically is the smallest bath in the home, and it is the only room where guests judge your style in private. Master baths’ primary role is to make you smile every time you enter the room. 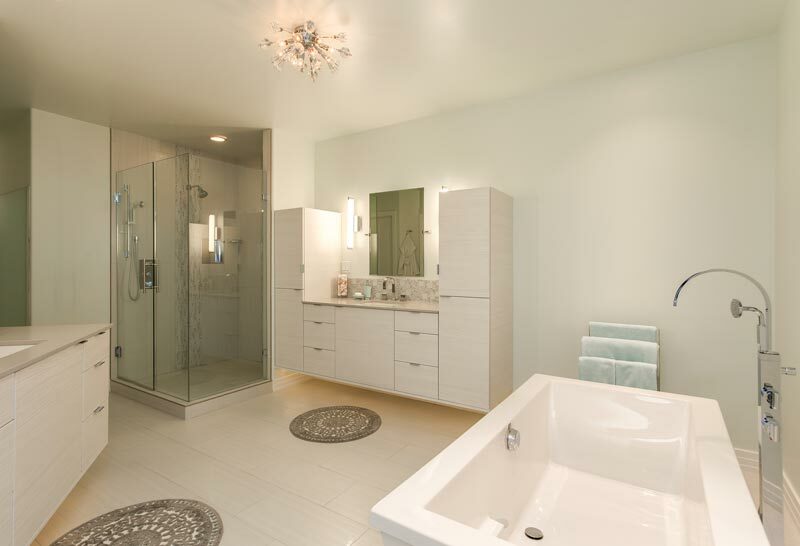 Good master bath design also allows for superb functionality that is easy to care for. The evolution of the bath allows for creative solutions that constantly surprise and delight. Today’s bath design combines modern and organic shapes that emulate the fluidity of water and use different materials, colors and fixture placement to establish feelings of calm and relaxation. Technological advancements, everything from smart phone applications to run steam showers to heated floors and countertops to touch faucets that are not only cool but also are more environmentally efficient, have enhanced functionality to deliver more enjoyable experiences in the home. There’s even an electronic shut off that sends a message to a smart phone if any fixture in your home is leaking. The self-cleaning bathroom is not too far away. From rimless water closets and easily removable toilet seats to antibacterial coatings and electrolytic water treatment, manufacturers are placing major emphasis on eliminating bacteria easily to make it easier on the user and less stressful. The use of color in the bath reflects how far the industry has come. 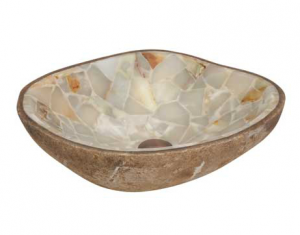 Traditionally, sinks were white and plumbing fixtures were plated either in chrome, bronze or brushed nickel. Now, finishes run the gamut of colors, shapes, and textures. Demand in our showroom for contemporary and transitional single-hole faucets continues to expand. Faucets with bright, fluorescent spouts and trim and bold colors can add accents to vanities. The array of new finishes includes gunmetal, pewter, matte black, black nickel, graphite, and gold. Gold is especially hot right now, offered in multiple tones – rose gold, brushed gold, polished gold, etc. Use of mixed materials to add both texture and depth to faucets and baths is another trend exemplified by tubs and sinks with matte exteriors and glossy interiors. There is a strong demand for finishes and materials that combine natural earthy vibes with a modern bent. Sinks and countertops with earth tones, gray and soft black finishes enable our clients to create a bathroom space that says wow! Wellness is another dominant theme in the world of today’s bathroom. Duravit’s Biotracer water closet, scheduled for a 2018 European debut, is being marketed as the first app-controlled toilet for urine analysis. The toilet will send to a smart device an analysis of 10 important health indicators ranging from blood sugar to pH-levels. From a design perspective, clean lines and minimalism continue to dominate. 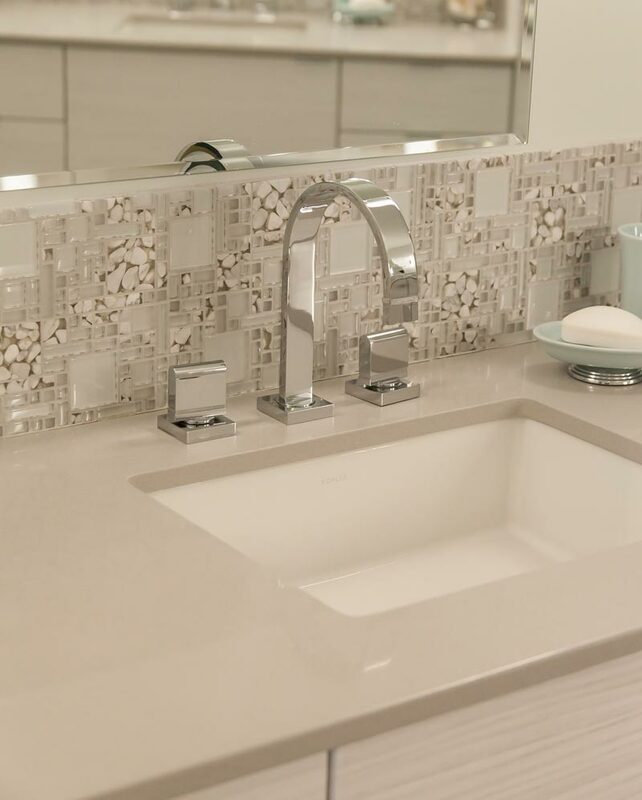 We maximize the functionality and look of smaller spaces by specifying wall-mounted sinks, faucets, and toilets to provide an impression and feel that are more open and contemporary. Wall mounting also makes a bathroom easier to clean. Environmental efficiency is another constantly involving trend. Dual flush toilets reduce the amount of water used. Water-efficient showerheads and faucets are now available that use fewer resources without compromising the bathing experience. 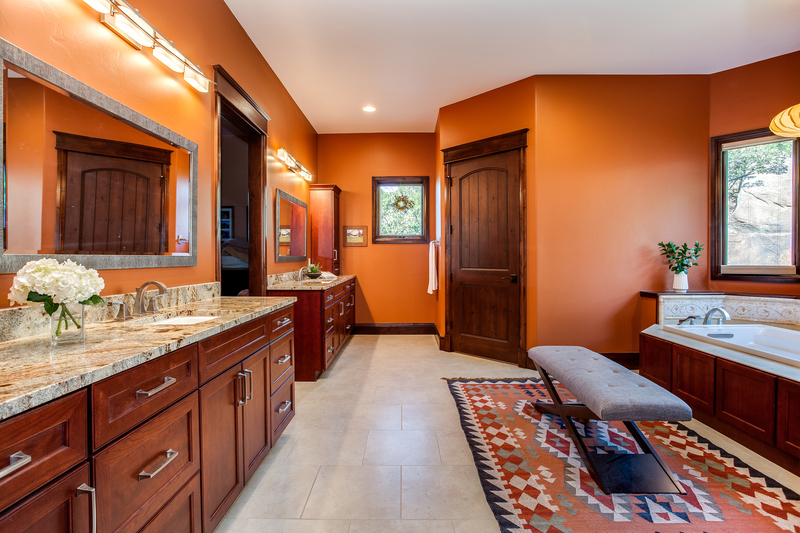 Master baths are becoming larger because many of our clients recognize the opportunity to create a personal oasis in their home that provides a space where they can have alone time for themselves. If you would like to capitalize on the technological, functional and aesthetic advances in bathroom design, please give our showroom a call. Our designer Juli delighted these homeowners with the custom bench outside their all glass shower. Doesn’t everyone need a Chandelier Over their Freestanding Bathtub? We think so. 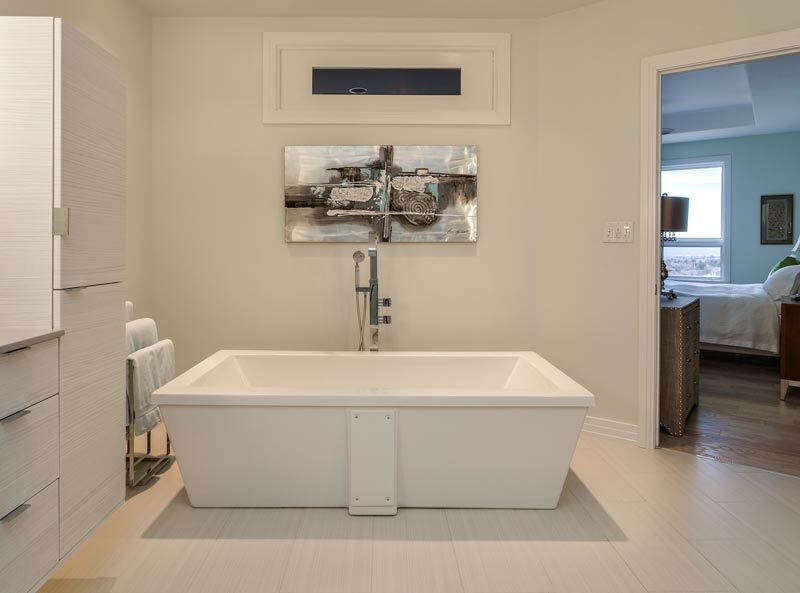 Perfectly White and Modern are the Keys to This Master Bath that certainly makes a statement. 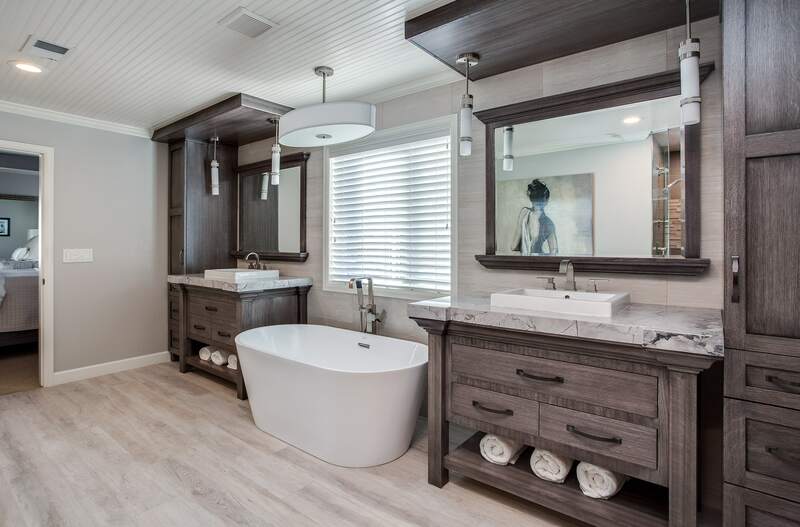 This spa style double headed shower with huge bench seats takes center stage in this new bathroom. This Bathroom photo gallery shows several styles of custom designed baths by JM Kitchen and Bath with showrooms in Denver and Castle Rock Colorado.